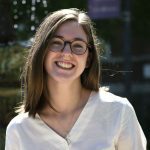 Meqbil, a senior Goshen College student majoring in molecular biology and biochemistry, worked as a research fellow at Purdue University’s College of Pharmacy — a position that is typically only available to Purdue students. From 8 a.m. to 7 p.m., five days a week, for 10 weeks, Meqbil hunkered down in a lab and studied the N-terminal methylation of 24 s.cerevisiae (baker’s yeast) substrates through investigating the role of a methyltransferase, TaeI, in the process. “The ultimate goal was to synthesize drugs and inhibitors that could hinder the ability of the human homolog genes from developing such diseases,” Meqbil said. But Meqbil pushed himself. He read several scientific papers a day and watched “too many videos” in hopes of understanding new scientific concepts and theories so that he could better understand the research he was conducting. Through the 10 week fellowship, Meqbil said he pushed himself to learn how to truly study, how to take tests and how to better manage his time. He said he’s now a much better student, due to the fellowship. Meqbil, originally from Hebron, Palestine, knew that international students often struggle to receive fellowship positions. In January 2018, Meqbil emailed 50 professors from all over the country and inquired about their fellowship positions. Meqbil said he received only three responses — one of which was from Purdue. He said he felt drawn to Purdue, more so than the other universities that responded. In that response, Dr. Tony Hazbun, associate professor of medicinal chemistry and molecular pharmacology at Purdue, asked Meqbil to apply for the research fellow program. Meqbil received an email of acceptance within hours. With his position as a research fellow, Meqbil was able to work on his own project — something he hadn’t expected. Meqbil said that research fellows often work alongside graduate students. He assumed his summer would be spent working as a lackey for someone else’s project. “My summer experience was entirely the opposite. I learned so much,” he said. 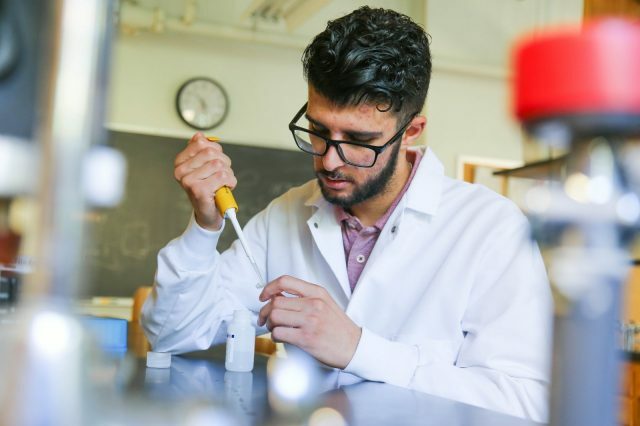 Now, as Meqbil begins his last year at Goshen, he says his classes seem to be a little easier — he’s quite familiar with much of what he’s learning in his biochemistry courses. It wasn’t always so easy, he said. He often thought about changing his major from molecular biology and biochemistry to something else — something easier. What first really solidified his passion for molecular biology and biochemistry was conducting research with Andy Ammons, associate professor of biology, and Doug Schirch, professor of chemistry, and former biology professor Kristopher Schmidt. And there are still struggles, he said. He’s currently preparing to apply for graduate school. Stanford University, the University of Texas Southwest, Purdue, Emory University, Rice University and more are on his list. Meqbil hopes to one day be a professor — after this summer, he’s sure he wants to spend his career in a laboratory on a college campus. He’s not quite sure what he wants to teach — maybe neuropharmacology, neuroscience or biochemistry. He is sure, however, that he wants to pursue drug discovery through research, especially after his summer at Purdue. Way to go Yazan! So happy to hear about this path opening up… Sounds like good things ahead.